Lori is amazing. Since a few years she has created the perfect party. It is huge (200 people joining), it has to do with beads, and the best... you can come in your PJs...... It's the bead soup party, already the 5th one, and I have participated in every single one of them. To learn about the party, hop over to Lori's blog and find out about the rules. Today I am blogging a bit late (a party yesterday is involved in that story, a flat tire, and a heating that blew up, but that is all for another post). And I need to say I am interpreting the rules a bit, Lori, I hope you are fine with it. My partner is Kirszti from Hungary, who sent me these beautiful beads.... Lava, wood, copper and mookaite jasper in all different sizes. And such a beautiful copper clasp. And have you seen these wonderful beaded beads? She made those (something I am totally not capable of). And a carnelian cabochon. I told Kirszti that I am taking a metal smithing class, and that I am learning how to make bezels. 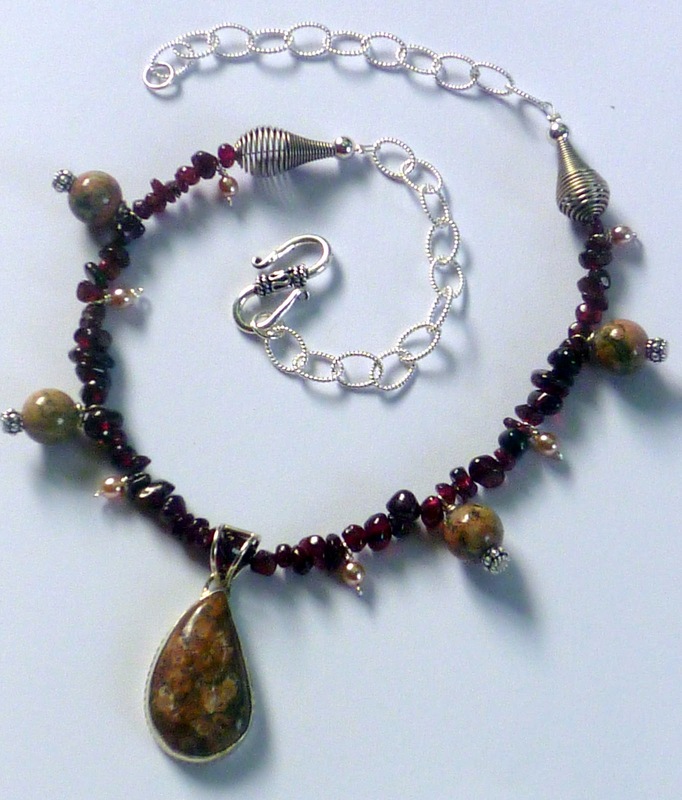 Since we are working with sterling, I wanted to use the copper clasp in a second piece and set the carnelian in sterling. Now here is the story that made me "interprete" the rules a bit. My class takes place every thursday, and while I got the bezel finished, the whole thing needs to be sent to a guy to actually set the stone. It was supposed to come back on thursday, and it did not. I was really bummed. And my beaded beads and most of the mookaite beads actually go into that necklace. 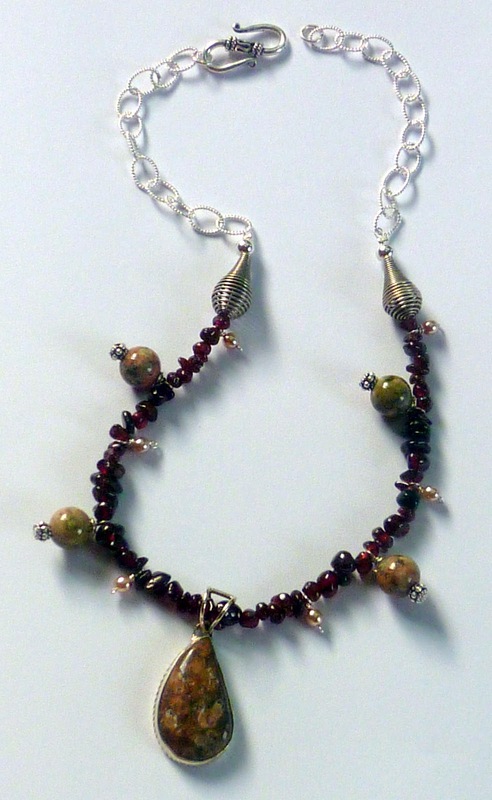 So I cannot show this necklace today since I did not get the pendant done, but I was lucky enough to get enough beads from Kirszti to also make a bracelet in which I used this beautiful copper clasp and the ring. And the wood beads. And the wonderful red beaded bead from Kirszti. I only added two garnet rondelles from my stash as little dangles. And I really love it. I have not been blogging in ages. And I know I have neglected a lot of my virtual friends. But the good news is I have good intentions to be back. The main thing that changed in my jewelry life is that I have completely moved to metalsmithing. Since I am taking my class once a week, I really have a hard time to go back and "just" use my beads. I still love them, I still buy them, but for every piece I want to cut and saw and file something... And the other issue is that it just takes longer to make something - so there is not so much to show. In some of the next posts, I will show you a couple pieces that I made. I made my good resolutions for the remainder of the year. So I hope you adopt me again :-). I made this pendant for Kriszti, sawed from copper sheet, filed, sanded. I was thinking for a long time how to attach a hook without destroying the design, but then I though - Kriszti is a seed beader, she will find a way. 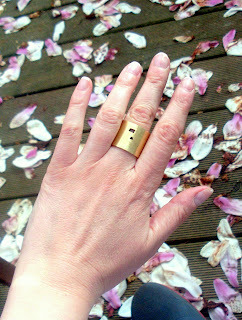 I also sent her a copper ring and made a kook for her to use as a clasp. She got garnet chips, purple seed beads, african recycled glass beads and some really beautiful silk ribbon I bought in my very favorite bead store in Paris. I also added a few different shell beads and wood beads, crystals, and some more copper beads, lampwork beads, and a copper button. I am having to much fun with this - so stay tuned for tomorrow's post where I show you the beads that Kriszti sent me. My partner for this bead soup party has been the wonderful Jackie Ryan of Kydo jewellery. She lives in England, in a wonderful small town, Ilfracombe (no, I have not been there, but along with the beads, she sent a wonderful towel that was handmade by a lady from her town, and it shows the harbor - so pretty). Jackie is a very talented artist, mainly working with Polymer Clay, a medium I always loved (I have tons of this raw stuff, but somehow all my "creations" look as if a 2 year old has spent an hour with PlayDough). Jackie does these great pieces - check our her store here. She sent me a really cool selection of beads, totally my colors (very earthy). I got a wonderful Jasper / silver pendant, a beautiful silver S-clasp, unakite, onyx and agate beads, some fancy jasper leafs, some pewter bead caps and silver spacers... plus one of her wonderful polymer clay pendants. Isn't this gorgeous? I want to put it in a bracelet where it shines by itself, with a lot of colors and ribbon - but as I am always late with my bead soups - this is for another post. I need to say as usual I created this in the last minute. Friday night. in between a metalsmithing class that I am taking this Friday and Saturday. I am so looking forward to later today - when I can continue my class and when I get home, that I can see all those wonderful creations from all my bead sisters. Thank you Lori for another wonderful time, for making us get in touch with all those wonderful people. You are not only a super talented designer, but such a sweetheart. You totally rock. Did you ever think this would become this big? I guess not. I can’t believe that it has been two years since the day you were born, since I stared at you an entire night, without closing my eyes one single moment, because I was scared to miss a single second of your life. Now you are two, and every day you make my life happier. Baby, I love you to the moon and back.You make me smile every day. Happy 2nd birthday, Amelia ! 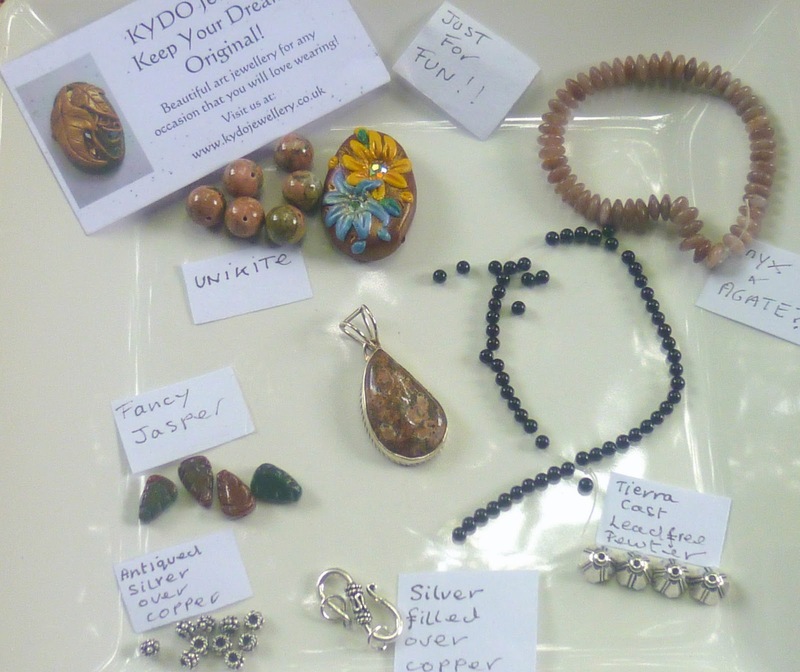 My dear friend Amy from Copper Diem has challenged us with something new - to create a piece of jewelry (any kind) inspired by a treasury, one specifically chosen for each participant. The treasury she picked for me is called IN THE GARDEN and I really liked it from the first moment I saw it. I knew at first sight that I would create something white and green. I wanted to challenge myself as well though. First thing that came to my mind was: "oh I could saw something from copper and then hammer it....." but.....I have neglected my beads. 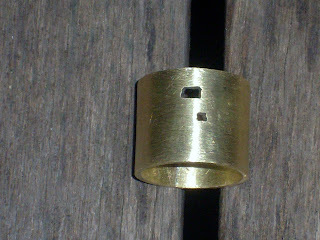 I am so in love with sawing metal right now that I do not want to touch my piles of beads anymore. No good. So my challenge for myself was: no metal. I need to say I had issues with coming up with something "just" out of beads. But in the end I decided for light and simple - something that I will wear. The pendant is made from howlith and silver wire, with a technique that I learned in a class in Pam's Bead Garden in Plymouth, MI (we actually made bracelets with this technique). It is delicate and I did not want to add more / heavier stuff to it. The ring is a glass ring that I have been keeping forever. 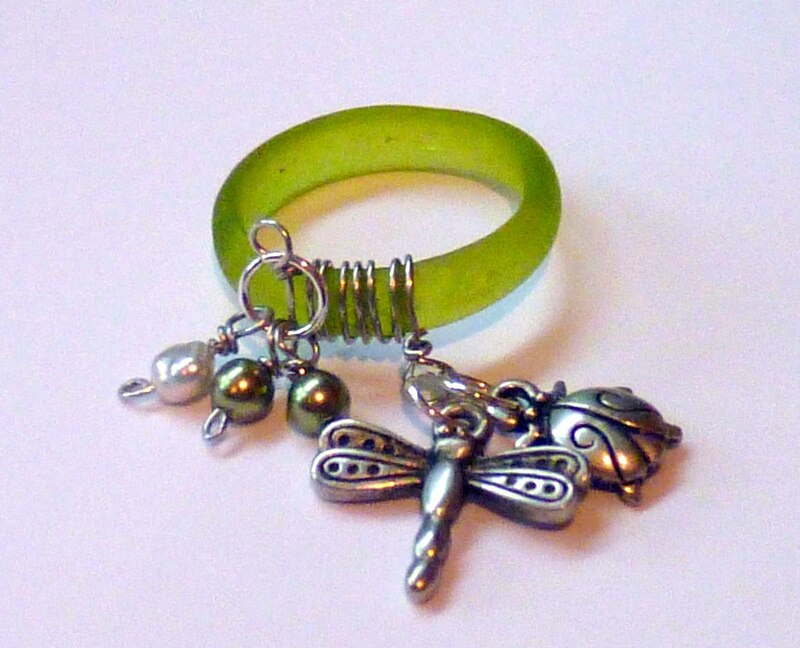 I wrapped again some silver wire around it and added some dangles made of freshwater pearls, svarowski rounds, a lady bug and a dragonfly dangle. I think they both turned out very cute. Thanks Amy for making me play with my beads again. And stay tuned for some more reveals in the next weeks. 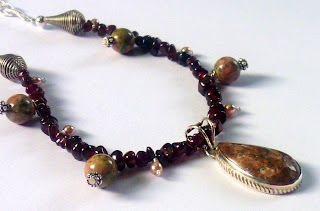 I am participating in Lori's 3rd BSBP and I am all excited about my lovely partner and the beads I am going to get. Today is my birthday - and..... good news - I got a new camera! So blogging frequency will improve. It was about time, since I have done quite a few cool pieces that I would love to show you guys. I still need to figure out the whole download thing, but hey, I already took some pictures at the party today. And yes, we had a little party today - the weather was ok except a few raindrops, we had cake and a BBQ with a few friends. Somebody asked me today who gave me the best present. It was not easy to choose with so many cool things I got.... but here is the answer.... TO YOU, dear friend, who gave me my best birthday gift, you made my birthday really special. And I hope I saw how happy you made me. So dear birthday-present-giver, to you, I send you hugs and kisses. ... is absolutely no fun to me. But when I was in Paris last week, my camera died. Which meant that I had to buy a disposable camera to at least be able to take some more Paris pictures, and which means now that I can't show you my latest "la lune" necklace (which I am so in love with). But I will either steal Nick's camera or buy a new one this weekend. I have been meaning to post this for a long time. For Christmas I had one wish - I wanted this "host necklace" made by The Noisy Plume. So Nick bought it for me and to you, Jill, thank you again from the bottom for making it for me (yes, ok, it was one of her host series, but I strongly believe that this was made just for me).Click here to see what she wrote about it. It is basically about the things we host, wanted to unwanted. And reminding us that we are able to decide what we want to host. Out with the dark, in with the light, Jill said. This little piece of jewelry is a special piece of art for me, as every piece Jillian makes. Go visit her blog by clicking here and read the stories she tells. Since I have got it, I have worn it quite a lot, especially on days like today when my heart is heavy. It truly reminds me of what I should host, and when I have tough days like today, I wear it to center myself again. The enameled metal focal gets really warm when you wear it, and I love the chain and the dangles. The hollows that are formed between my skin and the metal piece feel like and extension to my body, It feels like something warm builds up in these bubbles, something that is part of me. The things I should host. Today is a host day, where I need to remind me of what should be there, in my head and heart. I will not go into details, but the thoughts evolve around losing what is dear to you. and remember that you, and only you, decide what you host. I learned about this event from my beady friend Lori Anderson and immediately decided I wanted to participate.... but as always, I am a bit behind in timing. 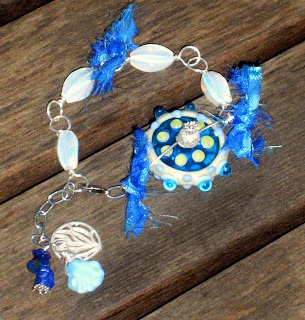 The idea was to make a blue bracelet in an adult size, which will be sent to The Global Genes Project, an advocacy group for children's rare disease awareness. The Global Genes Project then sends the bracelets to one of 7000 families having children with rare diseases to show them love and support. For my bracelet I used a lampwork bead I have been hoarding forever, and I believe I kept it just for this reason. 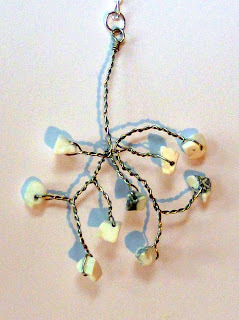 I added moonstone - it always makes me dream, and some recycled sari silk, along with a few dangles. Lori gave the hint to make the bracelet extendable, so I added a leaf charm, a shell charm and a few small lapislazuli beads. I am sooo sorry, but I am not sure if I can post my bracelet today. I was on a business trip in France and lost some major data of my most important work file right now. I have a presentation on Tuesday and am trying to reconstruct it. This plus a bad flu has kept me away from my beads. I know this is a bad excuse. But I will post it later today or latest tomorrow, so please forgive me and come back to see what I made. I have to say I am becoming a bit unfaithful to my beads. Because I have started a relationship with Metal. And it is pretty entertaining. Not a lot of words right now, but look at what I made this weekend. Some more cleaning and sanding to do - but I am truly in love. You get a special treat today, even though our reveal was already on saturday (scroll down for the original post), we have another mini-reveal today. Ihr habt das besondere Vergnügen heute noch einen Mini-Reveal der Bead Babes Challenge anzusehen, obwohl der eigentlich schon am Samstag stattgefunden hat (siehe unten für den grossen reveal post). 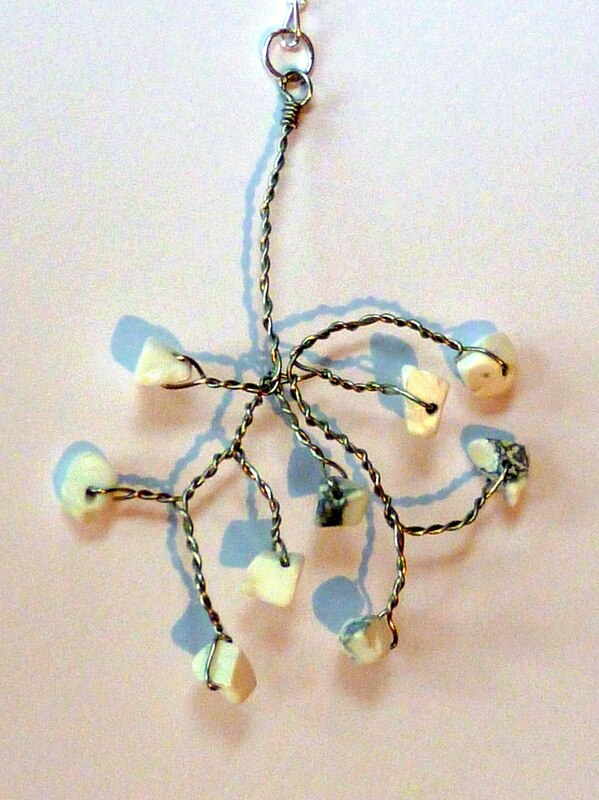 Maryse of GlassBeadArt Lampwork had issues with blogger (we are all too familiar with it, right? ), and that is why she asked me yesterday to post her necklace over here until the issue is fixed. Maryse von GlassBeadArt Lampwork hatte Probleme mit blogger (das kennen wir ja wohl alle, oder?) und deswegen hat sie mich gestern gebeten, ihr Kette hier zu posten, bis das Problem mit blogger gelöst ist. Maryse was thinking about Adele's Rolling in the deep as well at first, because it is her favorite song right now (very good taste, Maryse), but she decided to take something more "sustainable" and chose Ave Maria by Gounod. Maryse hat ursprünglich auch an Adele's Rolling in the deep gedacht, weil es im Moment auch ihr Lieblingslied ist (sehr guter Geschmack, Maryse), aber sie hat sich dann für etwas langfristigeres entschieden, und Ave Maria von Gounod genommen. The focal is a hand cast replica of a vintage pendant of the Virgin Mary. The beads are her own lampwork beads, turquoise, jasper and 2 vintage horn roses. Der Mittelpunkt ist eine handgegossene Replik eines alten Marienmedaillons. Die Perlen sind teilweise eigene selbstgemachte Glasperlen, dann Türkise, 2 alte Hornrosen und Jaspis. 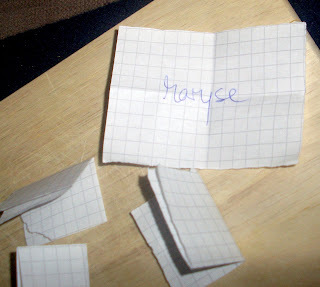 So please, be nice with Maryse and leave her a comment - here or later on her blog, once all is working again. Also, seid nett zu Maryse, und schreibt ihr auch einen Kommentar - hier oder später auf ihrem blog, wenn alles wieder funktioniert. Ok, we decided since we are 3 bead babes, we will have three giveaways. Congratulations, Maryse, and please email me your mail address and I will send you my surprise giveaway. And if you have not won mine, please check out Janna's and Stefanie's blogs and see if you are one lucky winner over there. And thanks to everybody for your comments, they mean so much to me. 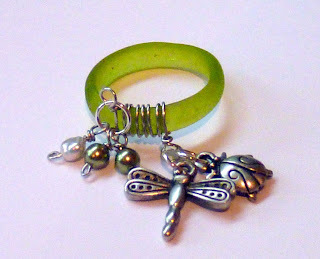 The big day is here - the reveal day of our Bead Babes Challenge: Blissed Out by My Favorite Song ! Der grosse Tag ist da - die Enthüllung unseres ersten Bead Babes Wettbewerbs: Glückselig durch mein Lieblingslied. The German bead babes Janna, Stefanie and myself are hosting our first challenge ever: Blissed out by your favorite song. 12 bead artists have created a piece of jewelry based on their personal favorite song. There were no other rules but to blog about the piece, and share your excitement about the favorite song. Today is the big reveal day, so have fun looking at what we all made, and leave us a comment if you’d like. You will find the links of all bead babes below. „Blissed out by your favorite song”, was soviel heißt wie “glückselig - oder auch inspiriert - durch dein Lieblingslied”. 12 Kreative haben ein Schmuckstück kreiert, das auf ihrem Lieblingslied basiert. Abgesehen davon, dass wir über unser Schmuckstück bloggen sollten und dabei auch erzählen sollten, was wir an dem betreffenden Song mögen, gab es keine Regeln. Heute ist der große Tag, an dem wir alle unsere Stücke zeigen, also viel Spaß beim Entdecken – und über ein Kommentar von Euch würden alle Teilnehmer sich natürlich sehr freuen! Die Links zu allen Teilnehmern findet Ihr unten. There are a million songs that I could have chosen. I am addicted to music, all kinds of music. But although I have hesitated to change my song last minute to one of the French singer ZAZ, I stayed with the original plan - ADELE and her wonderful "Rolling in the Deep". If you don't know it, listen to it, but I think it is almost impossible that you don't know it. Es gibt eine Million Songs, die ich hätte wählen können. Ich bin süchtig nach Musik, alle Art von Musik. Aber obwohl ich noch kurz gezögert habem in der letzten Minute mein Vorhaben zu ändern und einen Song von der französischen Sängerin ZAZ zu nehmen, bin ich doch beim Originalen Plan geblieben - Adele und ihr fantastisches "Rolling in the Deep". Wenn ihr das nicht kennt, hört es euch an, obwohl ich mir kaum vorstellen kann, daß ihr das Lied noch nicht kennt. Why is this special to me? For very many reasons. Adele has kept me company for quite some time, her voice touches my soul, and I have gone through a lot of emotions in the past months with this song in my heart.And recently when the video starts on TV, my 19 month old starts screaming of excitement and hands me the remote control to increase the volume. And if it's over she begs me to restart it - which is quite difficult to restart a video on MTV ;-). She loves Adele as much as I do. Buy her albums "19" and "21", you will not regret it. Warum ist das Lied etwas besonderes für mich? Aus vielen Gründen. Adele ist seit längerer Zeit bei mir, ihre Stimme berührt meine Seele, und ich habe eine ganze Menge erlebt in den letzten Monaten mit diesem Lied in meinem Herzen. Uns seit kurzem fängt meine 19 Monate alte Tochter an zu kreischen, wenn das Video im Fernsehen läuft, und bringt mir die Fernbedienung, damit ich das ganze etwas lauter drehe. Und wenn es vorbei ist, bettelt sie mich an, damit ich es nochmal anschalte - was etwas schwierig ist, ein Video auf MTV neu zu starten ;-). Sie liebt Adele genauso wie ich. Kauft ihre zwei Albums, "19" und "21", ihr werdet es nicht bereuen. So here is what I made. I took some of the lyrics and created my piece around it. Das hier ist meine Kreation. Ich habe einen Auszug aus dem Text genommen, und mein Stück danach kreiert. "You had my heart inside of your hand, and you played it to the beat..."
I sawed and files and made this copper hand. It is a copy of my baby's handprint when she was 6 weeks old (yes, her hands were huge when she was born). 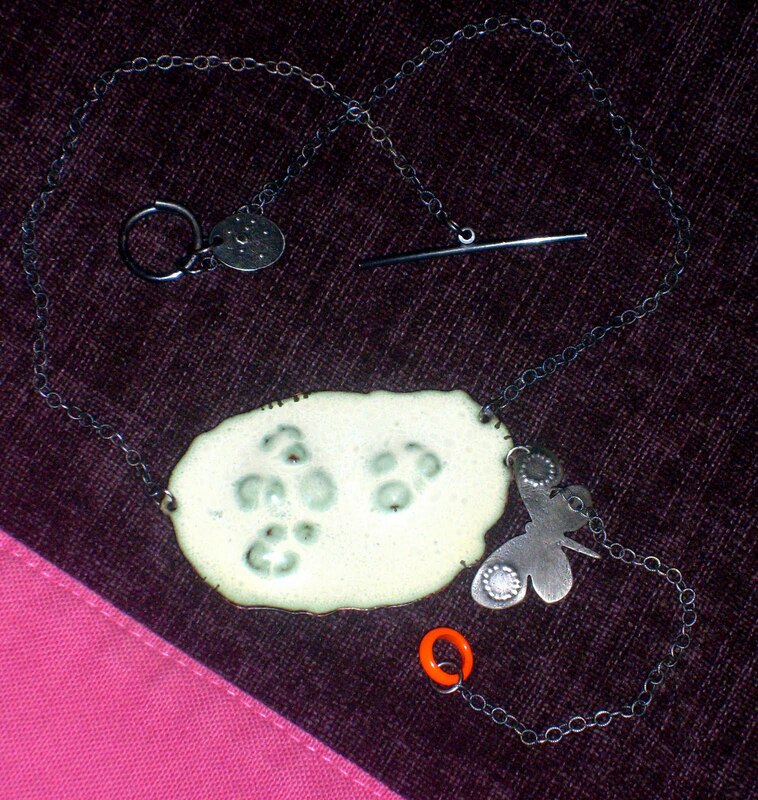 And I soldered a heart on top, cut some of the words to put them in there and filled it with resin. I wanted to keep the chain quite simple and let the pendant stand out by itself. And maybe I will add some ribbon or a few beads, we'll see. That's it, simple, but straight from the heart. Ich habe gesägt und gefeilt, und diese Hand aus Kupfer gemacht. Es ist ein Abdruck von der Hand meiner Tochter, als sie 6 Wochen alt war (ja, genau, sie hatte schon damals riesige Hände). Darauf habe ich ein Herz gelötet, den Text hineingelegt und das ganze mit Resin gefüllt. Die Kette selber ist einfach gehalten, denn ich wollte, daß der Anhänger der Star der Show bleibt. Und vielleicht ergänze ich noch etwas Stoff oder ein paar Perlen, mal sehen. Sehr einfach, aber es kommt von Herzen. Thank you, all Bead Babes, to play along with us. We had a lot of fun. And to make it even more fun, we will draw a winner of our surprise giveaway tomorrow, Sunday, the 9th. So stay tuned. And now, hop around and check out all the great pieces that we have made, and leave a comment if you like (we love them). Danke liebe Bead Babes, daß ihr mitgemacht habt. Wir hatten viel Spaß mit euch. Und damit der Spaß nicht so schnell aufhört, ziehen wir einen Gewinner für unser Überraschungs-Giveaway, und zwar morgen, am Sonntag, den 9. April. Also kommt wieder und seht, ob ihr gewonnen habt. Und jetzt, macht euch auf, und hüpft zu den anderen blogs und guckt euch die anderen Stücke and, und schreibt einen Kommentar, wenn ihr Lust habt (wir lieben Kommentare). 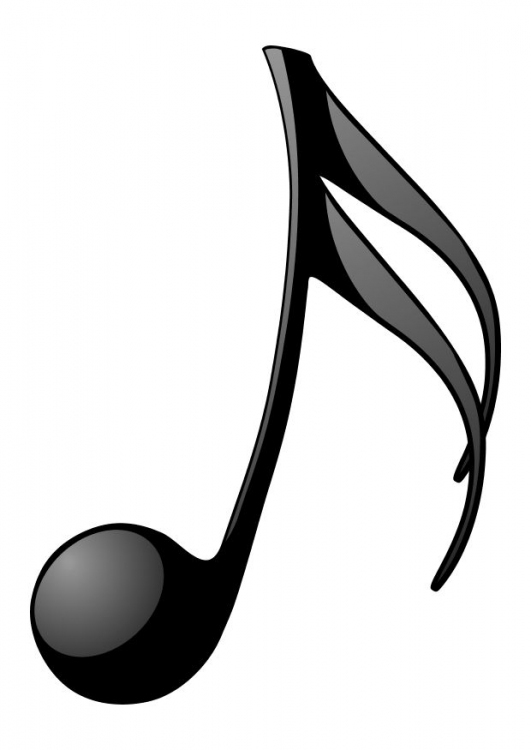 The German Bead Babes go challenge: Blissed out by ….. your favorite song ! Through various bead events on the net we got inspired to challenge you bead people out there with something new. The thing that is constant through all challenges: it is about beads and jewelry and your creative ideas. What is new is the team and the theme: The German Bead Babes go challenge: Blissed out by ….. your favorite song ! So, up for something fun? Über verschiedene Perlenevents im Internet sind wir auf die Idee gekommen, euch Perlenliebhaber auch mal herauszufordern. Was gleich bleibt: es geht um Perlen und eure Kreativität. Das Neue sind das Team und das Thema: Die Deutschen Bead Babes machen eine Challenge: Glückselig durch... dein Lieblingslied. Also, habt ihr Lust auf drauf? Stolze Mama, liebt das Leben und die Natur, Perlen- und Drahtsüchtige, Ehefrau, Freundin, Dienerin von zehn Katzen und einem Kaninchen, macht das weltbeste Risi e Bisi (Risotto mit Schinken und Erbsen). I love jewelry - chunky, bold jewelry. I also like mystery-novels and cooking. Ich liebe Schmuck - fetten, bunten prächtigen Schmuck. Außerdem liebe ich Krimis und Kochen. Mommy of a 18 month old girl, Automotive Strategic Planner in the real world, collector of beads since 4 years, lover of nature, animals, and good food, the creative soul behind nickisreef.etsy.com. This will be our first challenge, but if we have fun, it might become a recurring event. The theme of the first one will be “Your favorite song”. 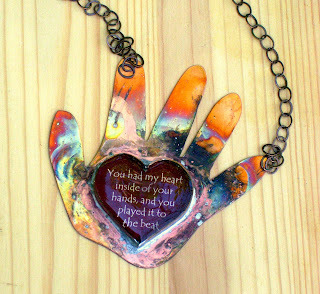 You pick your own favorite song, and create a piece of jewelry with this song in mind. No other rules, use as many beads as you want, in any color, shape and size. On April 9th we will do a blog hop, talking about our piece of jewelry and our favorite song, and why it is inspiring to us. Maybe even some of the lyrics. Anything you like. And we will post links to all other music lovers, so we can see all the wonderful things the other artists made. Dies wird unsere erste Challenge, aber wenn es uns und euch Spass macht, dann machen wir daraus eine regelmässige Sache. Das Thema der ersten Challenge wird „mein Lieblingslied“ sein. Ihr sucht euch euer Lieblingslied aus, und kreiert ein Schmuckstück, was sich um diesen Song dreht. Keine anderen Regeln, benutzt so viele Perlen wie ihr wollt, in allem Farben, Formen und Grössen. Am 9. April veranstalten wir dann einen Blog Hop, und schreiben einen Post über das Schmuckstück und das Lieblingslied, und warum es uns inspiriert. Vielleicht auch über den Liedtext. Was ihr wollt. Und wir posten die links zu allen Musikliebhabern, damit wir die wunderschönen Kreationen der anderen Künstler sehen können. The german girls have decided to make your mouth a bit watery and get a bit of excitement going around our challenge – so there will be a prize. 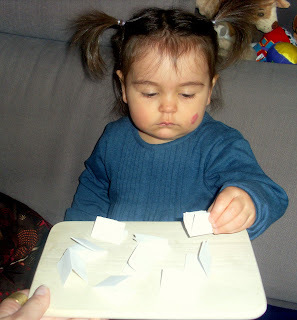 Each of us will select something from her stash. We will do a random drawing the day of the blog hop and you will automatically be entered if you show your piece on your blog. If you don’t have a blog but would still like to participate, contact us and we will include your piece in our reveal posts on April 9th. Wir deutschen Mädels haben uns entschieden, euch den Mund wässrig zu machen und gleichzeitig die Lust auf unsere Challenge etwas zu erhöhen – daher gibt es auch einen Preis. Jede von uns wird etwas aus ihrer privaten Perlensammlung beisteuern. Am Tag des Blog Hops verlosen wir dann diesen Gewinn unter allen Teilnehmern, ihr seid also automatisch dabei, wenn ihr euer Schmuckstück auf eurem Blog zeigt. Wenn ihr keinen Blog habt, aber trotzdem mitmachen wollt, dann schreibt uns und wir zeigen eure Kreation auf unseren Posts am 9. April. Sign up starts today and will last until Wednesday March 16th. Please send your name, email and blog address to one of us. We will compile a list and share it with you, so you can post it as well on the blog hop date. The reveal date will be on Saturday April 9th. So spread the word, sign up soon and start thinking about your favorite song. Hope to see you soon. Die Anmeldung startet heute und läuft noch bis Mittwoch den 16. März. Schickt dafür euren Namen, eure Email und die Blogaddresse an einen von uns. Wir erstellen dann einen Liste und schicken sie euch, damit ihr sie dann am Blog Hop Tag auch posten könnt. Der Tag, an dem wir unsere Schmuckstücke posten, ist Samstag, der 9. April. Also, erzählt das weiter, schreibt euch bald ein und fangt schon mal an, über euer Lieblingslied nachzudenken. Und hoffentlich bis bald.